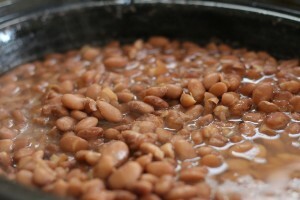 Pinto beans pack a healthy dose of Folate (Folic Acid), vitamin B9. There are several reasons to get adequate amounts of this important vitamin. Folic acid allows the body to perform many essential functions, including DNA synthesis and repair, red blood cell creation, and prevention of anemia. Perhaps most well-known is the prevention of fetal deformities (birth defects). Pinto beans are a naturally rich source and provide one of the highest natural doses at 294 mcg of folate in 1 cup – equal to 74% needed for a day.